Steven Spielberg returns to large-scale blockbuster film-making, with the 1980’s on his mind. Steven Spielberg has nothing left to prove as a director. He could quite happily retire tomorrow with an astonishing filmography containing some of the biggest crowd pleasers ever launched into cinemas. After all, he practically invented the summer movie season with Jaws (1975). So when he decides to take on a big project, it's worth keeping an eye out for it. 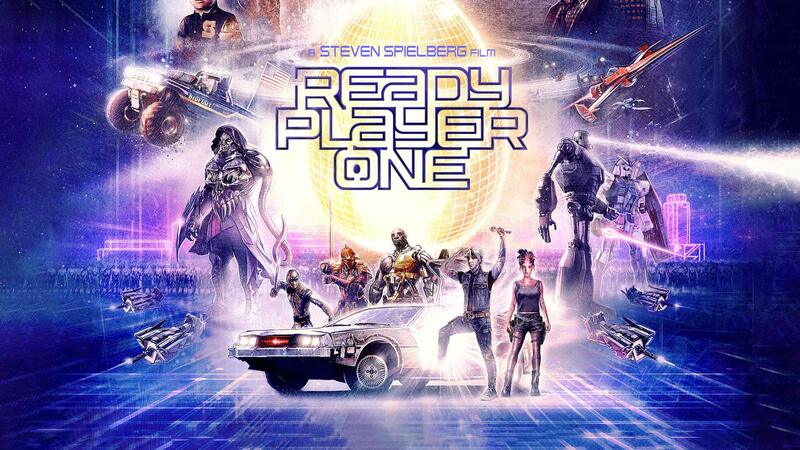 Ready Player One is an adaptation of Ernest Cline's 2011 science fiction novel, set in a future dominated by a virtual reality game called the OASIS (Ontologically Anthropocentric Sensory Immersive Simulation, for the fans of acronyms out there). The film is full of references to the popular culture of the 1980's, a decade that Spielberg dominated with his output, both as a director and producer with the likes of Raiders of the Lost Ark (1981) and E.T: The Extra Terrestrial (1982). It's interesting to then place him as a director of something that he has had a large influence in creating. The careful balance needed to pull together an ostensible homage to his own work and to make it thematically engaging is a very fine line to walk, and Spielberg very nearly gets there. As ever with his work, the action sequences are expertly delivered and now that the virtual reality setting of the OASIS has allowed him complete free reign over his camera, with some dizzying use of blocking and movement, he truly immerses himself into the world of his characters. One particular sequence – a lengthy series of car races, featuring the iconic Delorean from Back To The Future (1985), Spielberg protégé Robert Zemeckis getting a couple of name checks – shows this mentality to its fullest, the camera paying scant regard for gravity and physics of the real world. Another, set in a dance club and soundtracked by New Order's "Blue Monday", again highlights how much fun he’s having with the technology. Certainly in more of an obvious way than The Adventures of Tintin: The Secret of the Unicorn (2011). With one later sequence, he successfully takes the iconic work of one of the 20th century's greatest visual artists and recontextualises it. Nothing if not the message of the film as the sheer amount of references to popular culture on show – some more obvious than others, as Spielberg largely lets the audience decide on how to interpret them. It's good for those less aware of what is being thrown at them. The real world, by contrast, is rather colourless and decrepit but he's careful to suggest that it's here that the characters truly belong. If anything lets the show down, it's the script and its exposition-heavy and episodic structure. Its characters are underwritten and not all that engaging to watch. Tye Sheridan looks the Spielbergian type, especially as an Amblin production, but he isn't given much to work with as Wade Watts and his game avatar of Parzival. Faring slightly better is Olivia Cooke as Samantha/Art3mis. She starts out as a fierce, independent character with her own agenda though that is largely forgotten by the third act. The character you sense is thematically Spielberg's surrogate is James Donovan Halliday (Mark Rylance) the late creator of the OASIS, with his partner Ogden Morrow (a slightly underused Simon Pegg). Halliday's Willy Wonka inspired quest for someone to take over his gaming empire and play in the sandbox he's created, could reasonably be argued to be Spielberg’s thoughts on his countless successors and imitators. But this time he seems determined to play them at their own game and he succeeds with a largely fun, visually exciting and surprisingly personal adventure film – but not one that you'll be thinking about too strongly after you have seen it. Ready Player One hits American theatres March 29.